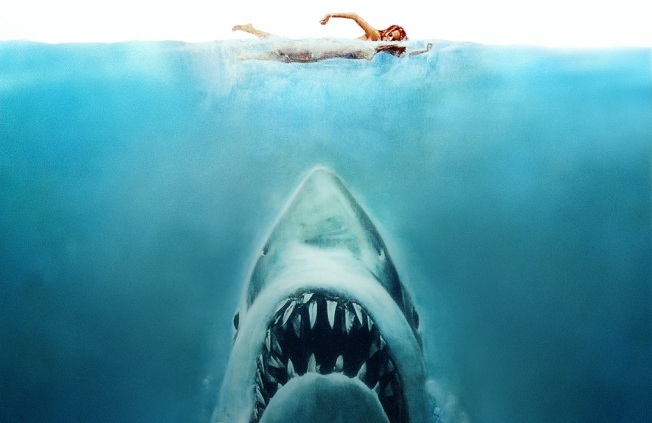 In case you've been waiting (possibly, since before you were even born) to see children getting devoured by a giant great white shark on the big screen, tonight is your chance: See the dangling legs and bloody waters of "Jaws" as they were meant to be viewed. Sunshine Cinema on the LES is kicking off a new midnight movie series with Spielberg’s 1975 classic, screening it Friday and Saturday night. The Sunshine has even compensated a little for 34 years of inflation (a ticket to the premier would have run you about $1.75) by dropping their regular price to $9.99. No matter how many times you've seen the movie on TV, it can't compare to see it in a crowded theater on a summer weekend with John Williams ominous score blaring. What better way to kick off a weekend before heading to the beach? And if your girlfriend has been trilling on and on about not going out to the Hamptons this summer, this might be the perfect remedy. Of course, you'll want to remind her of this.